Reliability. Of all the qualities one could ascribe to the Mission: Impossible movies, that one is the most cogent. This has especially been true since writer/director Christopher McQuarrie (who seems to be Tom Cruise’s personal screenwriter) took over for the last two films. Combined together, Rogue Nation and Fallout represent the best the series has had to offer, with the latter building on plot threads introduced in the former. This latest movie, the sixth in the series, offers everything its predecessors have done, except amped up to almost Fast and Furious levels. It’s a strong, engaging spy thriller with plenty of action and a convoluted storyline. Like most refrigerator movies, the holes become apparent upon reflection but the pacing is so relentless that they don’t interfere while in the theater. 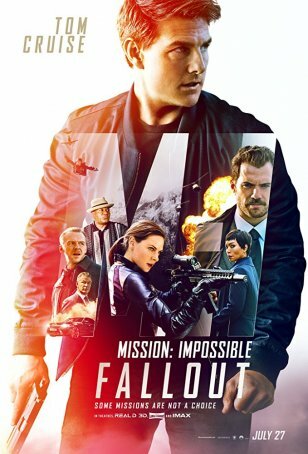 Although perhaps a little too long and not as tightly plotted as Rogue Nation, Fallout offers everything a viewer could reasonably expect from a Mission: Impossible production. It’s reliable. This movie’s Macguffin is a suitcase containing three globes of plutonium that Ethan loses early in the proceedings when faced with the decision to either save one of his friends or protect the nuclear material. According to director Hunley (Baldwin), he chooses wisely. Sloan, however, doesn’t agree and sends Walker on Ethan’s next mission to ensure that the job gets done. The plutonium is wanted by The Apostles, who are the remnants of The Syndicate, which was effectively dismantled at the end of Rogue Nation. Ethan finds a “broker” named White Widow who is willing to obtain the plutonium for a price: captured Syndicate mastermind Lane, who is currently in custody. Ethan has to arrange his escape without killing too many people. Things get complicated, of course, because Ilsa has been recruited by MI6 to kill Lane in order to regain her standing with Britain’s spy agency. This brings her back into contact with Ethan and Lane. McQuarrie’s vision of the Mission: Impossible movies is that, in addition to the heavy Bond influence, they should include over-the-top action sequences reminiscent of the Fast/Furious films and cat-and-mouse caper movie elements that provide surprise twists. Fallout does a good job of melding the heavy lifting of narrative exposition with at least a half-dozen high-octane action scenes, one of which features a lengthy rooftop chase and another that’s focused on a helicopter showdown. There are also the obligatory shoot-outs, fist fights, and car chases. The romance is understated, not even featuring a kiss, but there’s palpable chemistry between Cruise and Ferguson.